Jose Fernandes moves all-in for his last 70,000 with the blinds at 20,000-40,000 from under the gun. 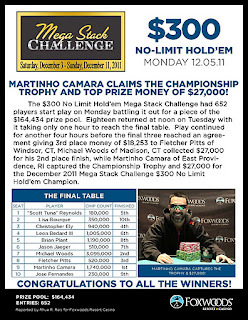 Michael Woods calls from the button and Martinho Camara raises from the big blind to 150,000. The turn comes the [Qc] and the river is the [5s]. 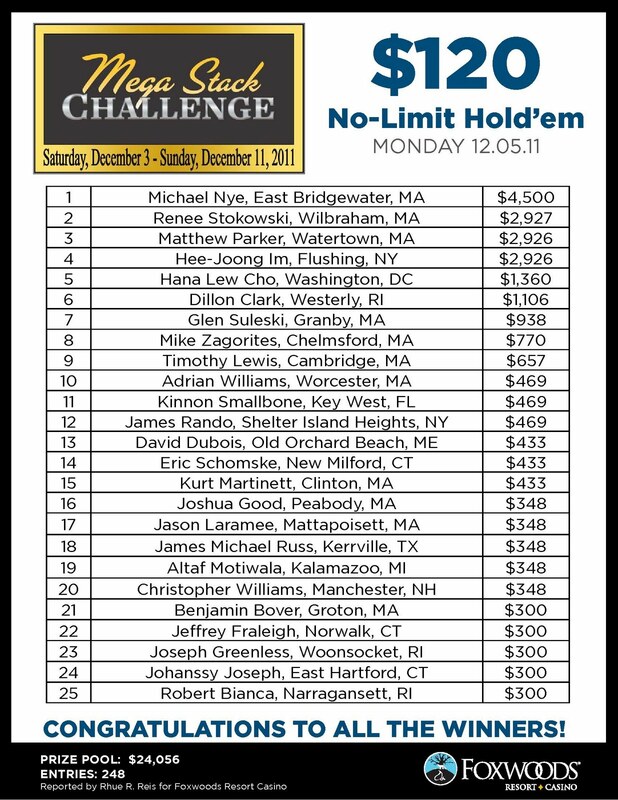 Woods wins the pot and eliminates Fernandes in 9th place for $3,241. The board runs out [Qd][9h][4s][6s][2s] and Camara catches running spades to beat out Bourque's set of sixes. Bourque is eliminated from the $300 Mega Stack event in 10th place for $1,890. We have reached the final table of the $300 Mega Stack Challenge event. Day 2 of the $300 Mega Stack Now Underway! 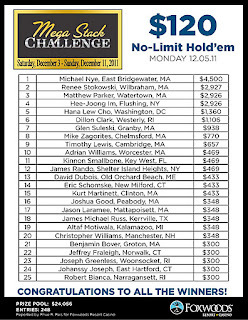 Cards are in the air on Day 2 of the $300 Mega Stack Challenge. You can watch all the action by clicking "Watch LIVE Feature Table" at the top of the page or by clicking HERE. There are 18 players remaining and the average chip stack is 543,000. Play has ended for the night in the $300 Mega Stack Event. The 18 remaining players will return at noon tomorrow and play to a winner. 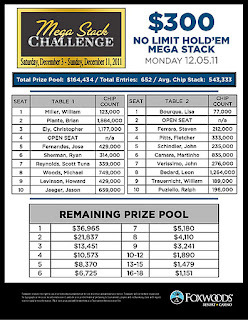 The final chip counts and Day 2 seat assignments will be posted momentarily.